UNIQUE 5PL SERVICES started as an express operator rapidly establishing itself into a global brand recognized for its quality service and unique multi-product offering. After this long journey of successful services, Unique 5PL Services continued to expand and excel as a privately owned company, establishing global alliances and gaining stronger brand recognition. In 2014, the company become a Pvt. Ltd. organisation as UNIQUE 5PL SERVICES INDIA PVT. LTD. with a strong network and infrastructure. And completely integrated information & communication technology infrastructure connects Unique 5PL Services in all India self operations, enabling a seamless flow of information between Unique 5PL Services and its alliance members and customers. Unique 5PL Services has designed and implemented a quality management system that demonstrates its ability to consistently provide enhanced services. As a solution provider Unique 5PL Services recruits only the best and qualified people to provide its clients with customized services. Innovation drives the daily work at Unique 5PL Services. It dictates everything unique to ultimately serve customers with efficiency and care. Whether by devising better ways to communicate with customers or faster ways to track their shipments, innovation leads the process. This innovation originally stems from listening to customers and addressing their needs. Small ideas and big ideas coming from all levels of the company continuously feed and are fed by this creative atmosphere. Pox is an environment where creativity is celebrated and rewarded. Unique contributes to the progress of the communities in which it operates through supporting the same qualities it nurtures in its internal environment. It encourages and rewards innovation and achievement in the community through support for sports, education, entrepreneurship and literacy. 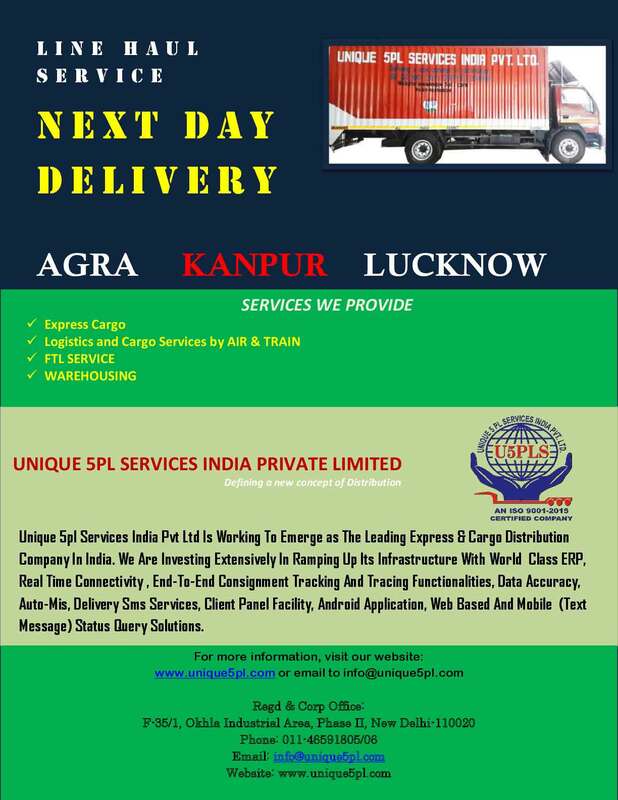 Unique 5PL Services aspire to become India’s most preferred end-to-end Logistics, Express & Retail Services conglomerate with comprehensive global reach. • Promoting Premium Express Products for better customer satisfaction and higher profitability. • Value-added services to cater to evolved demands of customers. • Continuous optimization of resources to lower costs scientifically. • Revenue protection at every step of the value chain. • Track record of strong quarterly results. • Strong brand image through phased re-branding of all company outlets. • An inclusive business philosophy. • Delighting our internal and external customers and business associates through high quality service. • Continuous improvements in products, processes, services and quality management systems. • Creating an environment for nurturing satisfied, motivated and committed employees. • World Class ERP (SAP). • End-to-end Consignment Tracking and Tracing functionalities. • Android App for Employees and Clients to Track and Manage Consignments On the Go. • Web-based and Mobile (Text message) status query solutions. • Tech-based Mass Mailing solutions. Growth and Turnover: The Company is growing day by day and achieved an expected growth in Millions. At present, the turnover of company is more than 20 Crores.